Lighting the way through the corridors of power, Dan Jellinek provides a unique and accessible guide to democracy in Britain, explaining how its elements work – from national and local government to free speech, the internet and the rule of law – and the role that we, the public, need to play to keep the wheels turning. Illustrated by Harry Venning (Clare in the Community, Hamlet), People Power's mission is not only to explain but to galvanise and engage people in a positive way. If you want to know how your small actions can bring about big changes, how you can improve your lot and the lives of others, then you must read this book. Stand up and be counted. The power is in your hands. 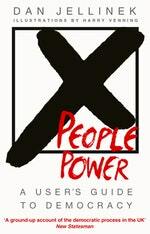 Love People Power? Subscribe to Read More to find out about similar books.